Does Having Hot Flashes Mean I’ve Started Menopause? Find the truth about questions that pique your curiosity in our series, “The Short Answer.” Women’s Health specialist Lynn Simpson, MD, answers this one about hot flashes. Q.: I’ve started having hot flashes at night. Have I started menopause? How long will this last? A.: Menopause by definition is the cessation of menses for 12 months. The average age for this in the United States is 51.4 years, with a range of 45 to 55 for most people. Perimenopause includes the years leading up to menopause and on average starts about four years before periods actually stop. This is the time when periods become further apart, and symptoms such as hot flashes may begin. The hormone fluctuations in the 40s can be quite pronounced, even when the cycles are still regular. That is why some women who are still having regular cycles will begin to have hot flashes. Hot flashes can occur intermittently during this time and frequently become more pronounced when the cycles start to lengthen. Some women will spontaneously stop hot flashes about a year after their periods stop. 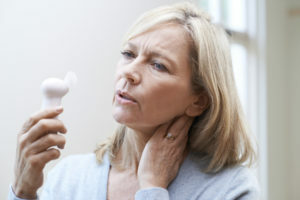 Many more will stop by four or five years after menopause. However, about 9 percent can continue indefinitely, even into their older years.